By nature, all puppies tend to be active, running around and ravenous- they just want to eat and eat. Then, they play and are curious about anything and everything. After they get tired of playing, they will sleep. And they would wake up and need to poo poo. Now, if your puppy looks weak, and have no appetite, please get your puppy checked for worms- the puppy could be having worms in the stomach and intensines. And if the puppy is generally weak, these worms will really multiply till it may just overwhelm the poor little thing. 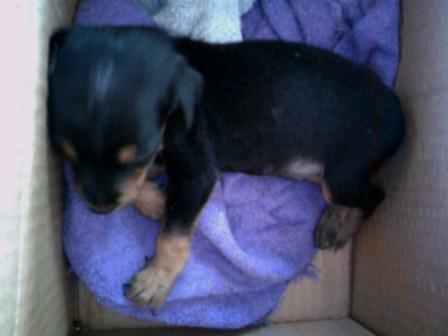 Without prompt medical attention, the puppy may just die. Recently, we got ourselves a new puppy. At first, he was keeping me up at night and I had to wake up at about 4am to feed him. Not long later, he lost his appetite and later, did not seemed to have mood for anything. My little pup when he was sick and we did not know his stomach was full of worms. He was weak from the vomitting. We’ve always had dogs- I did not know what was wrong with him because we’ve never had puppies who had to be dewormed. I hug the poor little thing a lot- spoke to him and asked him what’s wrong with him. One evening, feeling very sad on the thought of possibly losing him, I hugged him, closed my eyes and said a little prayer. Then, as I put him downon the floor, he walked weakly a few steps and vomited out clear liquid with what appears to be mee hon (fine strands of spaghetti strands) that actually moves…yikes. Immediately I rushed him to the vet and the vet give him liquid de-worm medicine (because it’s hard for puppies to take tablet form). It’s even meat flavoured. The vet told me that he got ring worms. And he was not optimistic- the next day I called him, he told me that even if I brought the pup over, there was nothing much he could do. RELATED: Is your dog overweight? When I took him back, he was weak and vomited a few times- each time there are worms coming out. But at least the worms no longer moves- because they’ve been killed by the medicine. It was touch and go for a few days- he had no appetite to eat and we were just wondering if he was going to make it. If your puppy is still not eating, then it’s better to force feed the fella with a syringe (buy the 5ml one)- that you can buy from pharmacies. You can feed full cream milk- like those you buy from the grocery store- but make sure it is not chocolate flavoured (because caffeine is dangerous for dogs and cats). If the milk is cold, mix with a few drops of hot water till it is warm. And always put the syringe at the side of the mouth and not directly in front. If you put in via the front, then the fluid may get to the lungs, choking the puppy (but for cats, you have to force feed from the front). Then press the milk slowly- wait for the puppy to swallow before pressing more in. At this stage, don’t overfeed- perhaps only 5 or 10ml each time will do. Or else, the puppy may vomit – that will make the situation worse. Also touch and stroke the puppy more- because studies showed that touching or hugging comforts the animal (and humans as well). But after each time, remember to scrub your hands with soap. If your puppy stopped vomited but is getting harder to force feed, try giving it cooked chicken liver. My puppy and another weak puppy (from the same litter who also had worms) immediately went after the chicken liver. 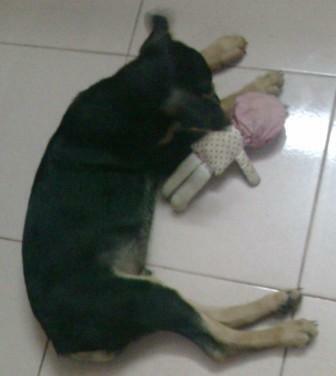 Now, he is growing more active and have a huge appetite and is very playful. De-worm meds and a little prayer does help. Note that a healthy dog could benefit from natural remedies in the same way a human takes a multi-vitamin or drinks cranberry juice. Natural products have properties which can provided an added level of support. They are not a substitute for conventional medicine, but can help to avoid circumstances where conventional medicine may be needed.